If you’ve been reading my blog regularly, you’ll know that we are planning a trip back to the Magic this year. 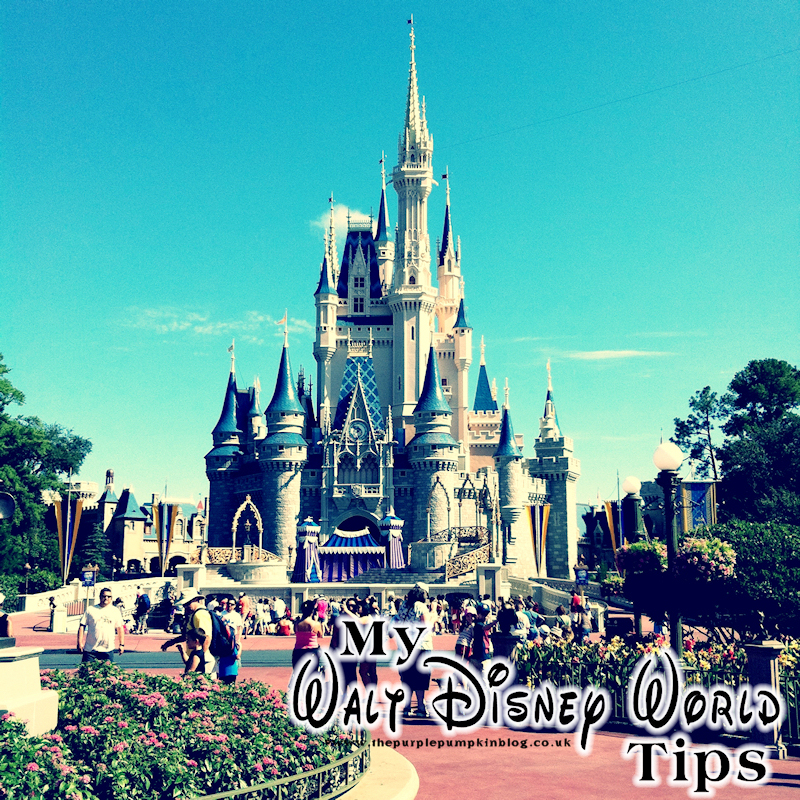 The magic being Walt Disney World in Orlando, Florida! We really can’t wait! My mind has been so far from blogging recently, I’ve not really shared much of late and it’s bugging me that I haven’t done so. I’ve had some Disney/Florida themed posts on my mind, and I thought I really must put pen to paper, or rather, fingers to keyboard to screen and get them done. As the next few weeks go by, I plan to be park specific, not only to WDW and the four parks – Magic Kingdom, Epcot, Animal Kingdom and Hollywood Studios, but also to the other theme parks: Universal Studios, Islands of Adventure, Discovery Cove, Aquatica, SeaWorld and Busch Gardens! Let’s hope I fit them all in before we step onto that metal bird to take us to Orlando! You are going to do a lot of walking and standing in lines at the theme parks, so my first tip is a no-brainer…wear the most comfortable shoes you own! Whether it be sandals, or Crocs, or trainers or flipflops…make sure that they are well worn in – now is not the time to break in new shoes! I personally wear Crocs – the Mary Jane style which aren’t so clumpy! My husband and son both wear trainers. Whatever works for you – wear them. Your feet will thank you at the end of a long day in the theme parks! Since I’ve spoken about the amount of walking you’ll be doing at Walt Disney World, we found it good to get ourselves in practise over here in the UK! That means, we regularly go out for long walks (2-3 miles) to get our bodies and legs used to it! It doesn’t matter where you walk, or the speed, just that you get yourself used to walking! We walk around the block, we walk in the park, we walk to the shops…we try and get a long walk in every day if we can! If you are quite sedentary (which many of us probably are with work and school) then you’ll be glad that you starting getting yourself fit and ready for Orlando! I’m not suggesting you go out and do that sort of mileage from the off, but work your way up in the weeks and months leading up to your holiday. A tired body is an unhappy body, and you don’t want to be unhappy in the happiest place on earth do you?! We kept seeing families using a spray can of sun cream, so we hunted it down in Wal-Mart and bought that. The suncream that we brought with us, went right back to the UK unused! The brand we used was called Coppertone, and it was fab! We would re-apply it every hour or so to protect our skin and it wasn’t messy to do either. In fact, we bought some to bring home to the UK for our next holiday (we thought we might go to the beach or something) but as it turns out, it’s going all the way back to where it came from! Similarly, you’re going to want to cover your head with something. Hubs and son both wore caps, I wore a headscarf/bandanna. I preferred that over a hat, which I wore on my first day and my head got way too hot. As I mentioned in tip #3, Florida is hot. It is also very humid. I did worry how us Brits (who these days barely seem to see sun or feel heat any more!) would cope, but we acclimatized pretty quickly, which of course we were pleased about. Keeping cool in those sorts of temperatures is a must! It’s great that practically everything that is inside is air-conditioned, so nipping into a shop to take away the heat for a while is a blessing. However, whilst waiting in the lines or just walking around you want to try and stay cool as well. We bought a couple of spray-bottle-fans which we filled with water in the mornings (and then re-filled at the water fountains in the parks), then turn them on for some moving air and water mist in your face! Refreshing!! I also carried around, a lace hand fan (which I’d actually bought for my wedding) to fan myself off whilst waiting in lines. I attached some string to the handle so that I could loop it on my wrist to make it easier to carry around with me. Even one of the parade entertainers thought it was a good idea since he nabbed it from me to fan off during the Move It! Shake It! Celebrate It! Street Party at Magic Kingdom :D And Chip thought Liam’s spray-bottle-fan would help him cool off! So, we’ve talked about the heat – protecting yourself from the sun’s rays and keeping cool, but also very important is Staying hydrated!! And this means water! (You don’t want to get nasty sun-stroke) If you are staying in accommodation that has a fridge, stock up on bottles of water from the supermarket – you can fill them up during the day from the water fountains dotted around the parks. If you are lucky enough to have a freezer, do as we did and freeze a few bottles of water as well to carry around. The benefit of this, is that it keeps the other water bottles in your bag cold, and by the time you drink from the frozen bottles, they’ve started to defrost in the heat – and that ice cold water is soooo refreshing! You can also ask for a cup of iced water at all counter services restaurants around Walt Disney World – for free. With all that humidity and heat in Florida, also comes rain! It rained every day that we were there – sometimes just short sharp showers, sometimes longer ones – but we never, ever, let it spoil our day. So, if it does rain, put your best British foot forward (or just your best foot if you’re not!) and keep on going! 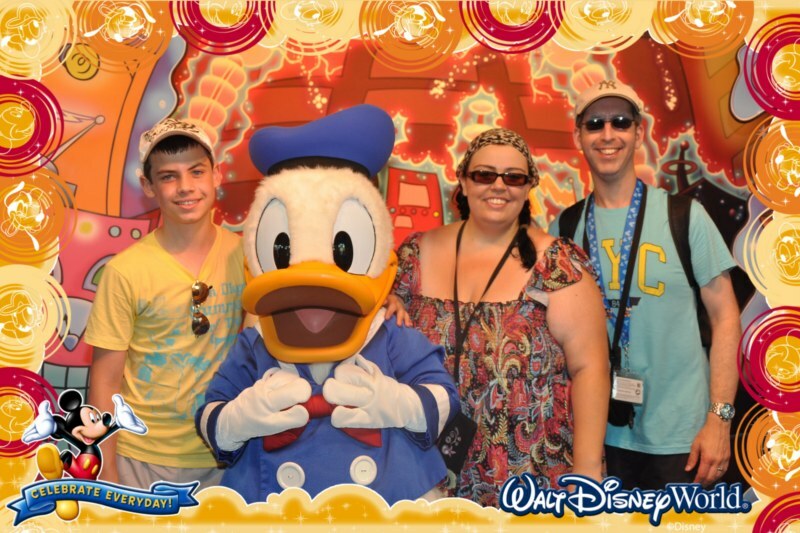 One of the days absolutely poured down whilst we were in Magic Kingdom, do we look like we let it spoil the day?! No sir-ee-bob! To that end, I strongly advise you take a poncho with you to the parks! You can buy Disney ones (they’re about $8) or you can buy them in supermarkets out there, we saw some in Target for $3, or you can buy them in the UK. Ours were actually 10p each when Tesco were getting rid of stuff a few years ago – always knew they’d come in handy!! We also quickly learned to stash a change of clothes in the back of the car – not just to change into if we got soaked in the rain, but from water rides! We got drenched at Kali River Rapids at Animal Kingdom and I was so glad to just be able to change out of my sopping wet clothes! I’ve mentioned ponchos and water and sun cream, so of course, you’re going to need somewhere to stash your stuff for your park visits. I’m working on us as a family of three with a teenage son, so if you’ve got younger (or older, or no) kids, this tip may not fit exactly with what you need to take with you! Hubby was the nominated packhorse, and we had a small backpack to keep everything in. If you need to take more stuff than you can bother to carry around all day, there are lockers at the parks to stash your stuff. We had the aforementioned suncream spray, bottles of water (some frozen) and ponchos and we also took an autograph book and pen, for all those important character signatures! We also had a couple of snacks – packs of crisps or something easy to nibble on that wouldn’t ruin in the heat. Since hubs and I both wear glasses, we had our glasses cases in there with our prescription sunglasses/normal glasses to switch from when going inside and outside. We took a bottle of anti-bac hand gel and I also had a lip balm in there as well. Another handy thing we took were plastic, zip-loc food bags – to stash our cameras and money in when going on the water rides. If you are staying onsite at Disney you will receive a Magic Band – this is your key to entering the theme parks, your FastPass+ allocations, paying for merchandise and food and your dining plan credits. If you have a regular ticket, you can keep them in a lanyard which hangs your neck. And finally at the end of the day and it’s time to go ‘home’, you need to find your hire car…they all look the same, there are a gazillion cars in the car parks…the way we remembered where we parked was to take a photo of the lot name and the bay number to remind us. The last thing you want to do is to be clicking the key fob, waiting to see which car unclicks and lights up!! (I had to do that at Epcot >_<) We also took a photo of our number plate to remind us which was ours! The car also gets very, very hot, so we used a windscreen shield that we bought from the Poundshop to block out the sun, and we also placed towels on the [leather] seats to stop bum burn!! And remember us getting soaked on the water rides? Well, those towels then come in handy to dry off! Before everyone gets in the car, turn on the ignition, open the doors and let the air-con run – when it first starts up after sitting all day in the sunshine, it blasts out hot air at first! What are your tips for keeping comfortable in the Florida heat? Some great tips here. I would absolutely agree with your first one – thinking about your feet is an absolute must, I personally choose trainers. And hydration is key too – we took a bottle each which we refilled during the day (they’re much better at the water fountain thing over there than we are in the UK) and also left bottles of frozen water in the car in a polystyrene cool box (a couple of $ from Walmart) which were ready to drink when we were leaving the parks.